2 registered (Kris B, anthropic), 52 Guests and 164 Spiders online. we also put some 6 to to 8-foot lengths of 10-inch PVC pipe between/under some of the stumps for the catfish to have some "spring break" fun. 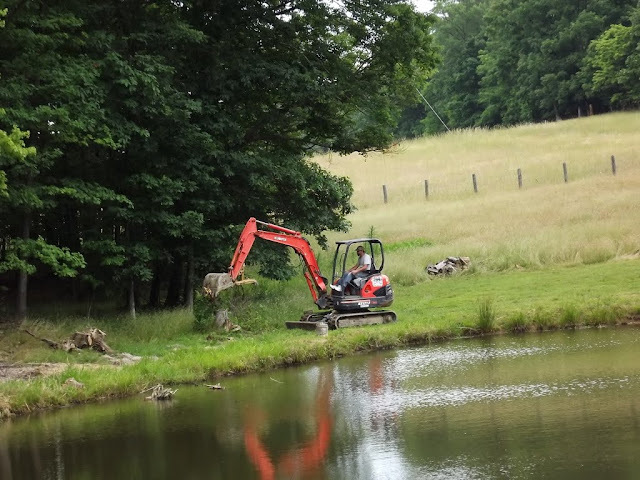 A friend also brought his excavator over pull out some stumps on the back side of the main pond, and to do a final positioning of the stumps we dumped in earlier as the new hiding places for fish. 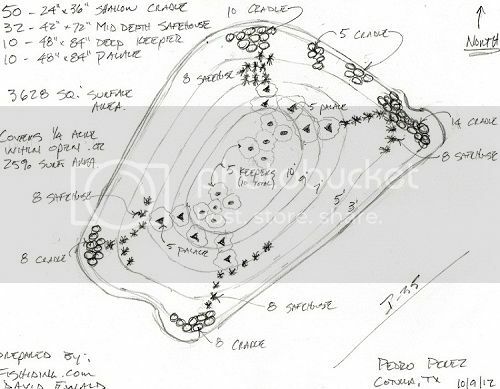 For some more detailed, advanced reading about sturcture vs cover plus some water weed information plus general info about pond stratification and turnover see this link. It also has a lot of basic information about angling. 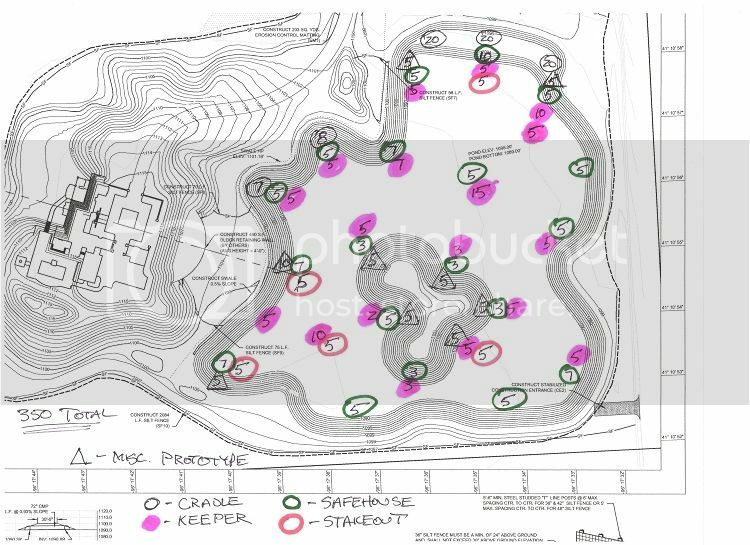 Description Layouts based on a final installation of 20-25% of a body of water's surface area in habitat of various materials. Structure pics compliments of the guys from FISHIDING. Take a close look at what is going on in the pics. Direct link to the Crib article on the Photographer's website. 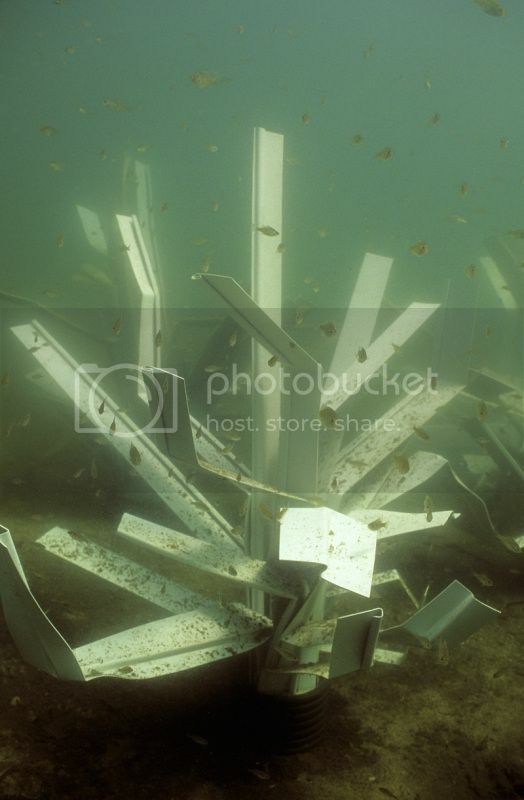 Scroll down to the June 16, 2013 post titled: Why Fish Cribs work, Why they fail. 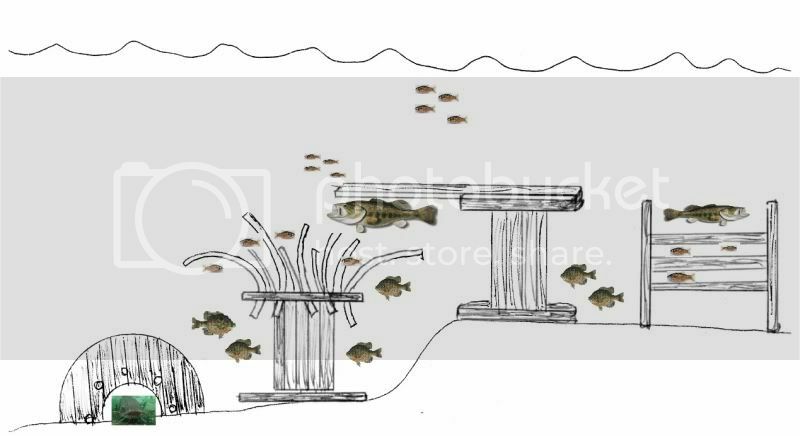 Also in the above link read the section about the benefit of weeds in a pond as cover and how they help in maintaining a diverse fish community dated June 29, 2013 Lake On The Brink. It is hard to duplicate Mother Nature with artificial structure. After looking through the archives last year, I decided to try something ewest had posted from a presentation at the PB III conference. Instead of tying the trees to a post, I looped them around a t post covered by a piece of used oilfield drilling pipe. Because of my water level fluctuations, I wanted something that could rise and fall with the water until the trees ultimately sank. 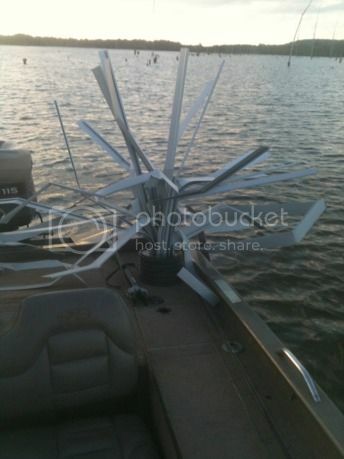 I did this last year, and it took approximately 3 months for the original Christmas trees to sink. Today, I just boated out to the posts, and it took less than a minute to hang 7 more Christmas trees over the ones from last year. 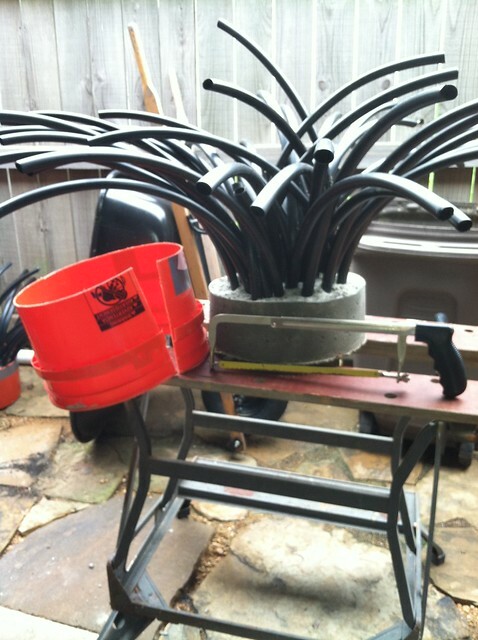 Oil field pipe is cheap, but any galvanized post would do. I just made sure to have it extend 6" above full pool, so the trees couldn't slide off the top. My CNBG were back feeding less than an hour after all the commotion. t post cover by a feeder. Close up of post and trees. 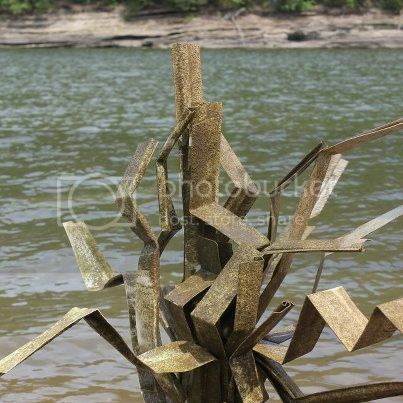 Barrel-tubing structure by JamieE Indiana. Hope the pics show up. A fun little pvc project I worked on. It's gonna be a fish magnet. 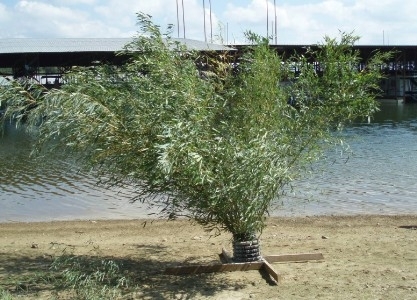 Video is 3.5 minutes long and it shows how easy the American Fish Tree is to use. 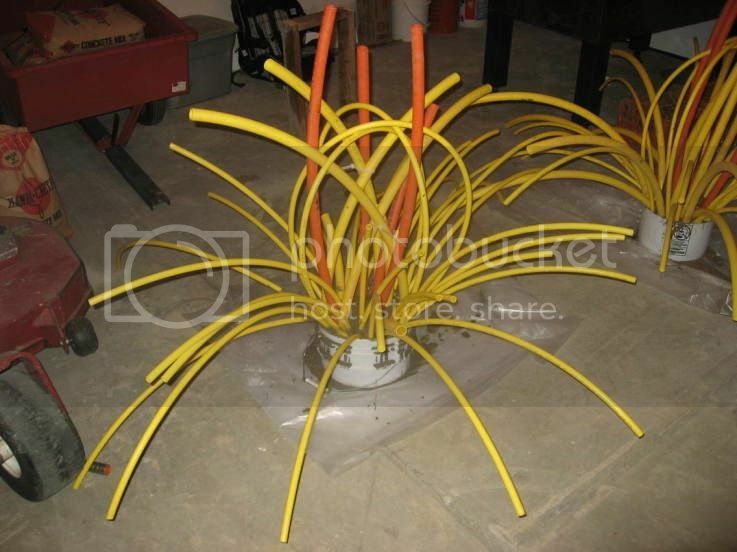 All PVC, heavy duty, no glues or fasteners. 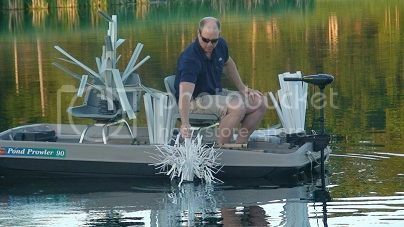 Assembled the Tree in 7 minutes while in the boat. 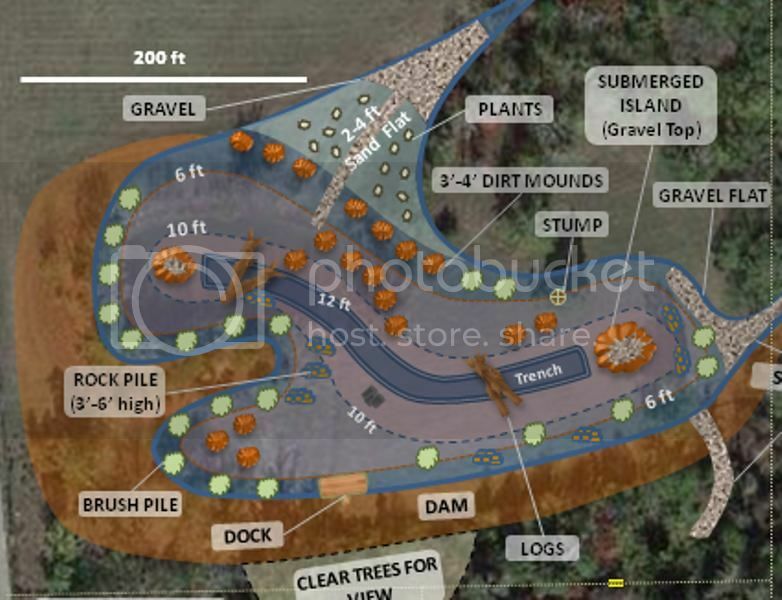 Habitat and structure ideas from Pennsylvania Fish and Game Commission. Variation of Ray Scott structure ideas by ewest. I put one in the upper neck. One about 30 yards to the east next to the overflow. And one tied to the fence on the west side. Didn't see any reason to use additional posts here. 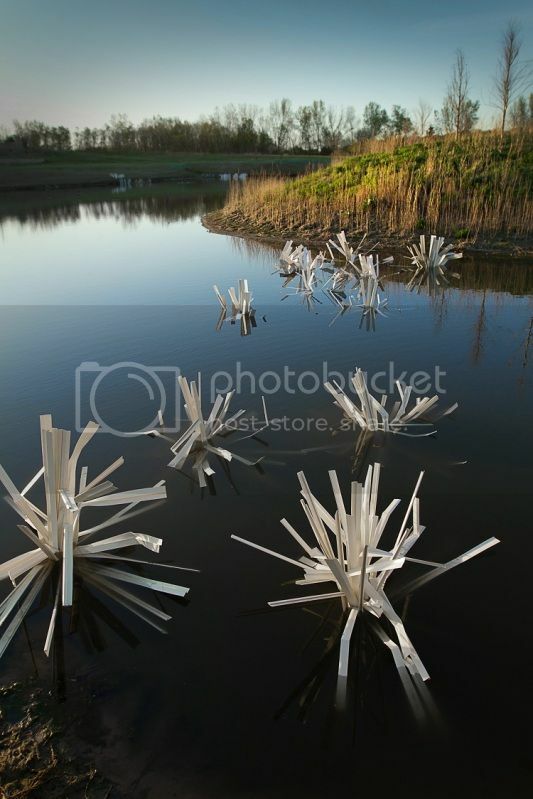 Shallow water brush piles by FireIsHot. 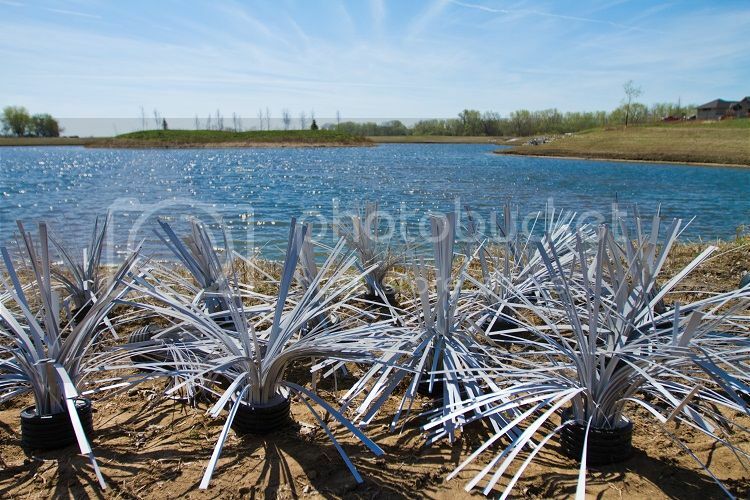 The first two pics are of a finished brush pile on a shallow water point. 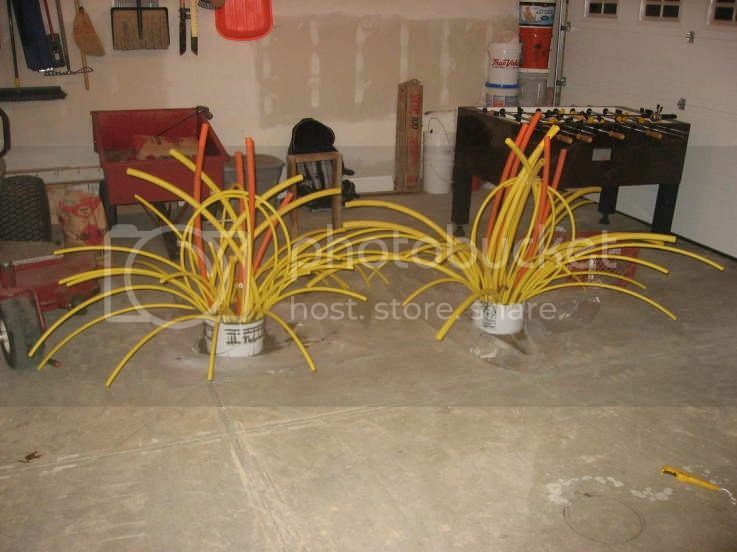 It covers 20'X40' area, and will be adjacent to a patch of hybrid lilies. Cover and summertime shade. 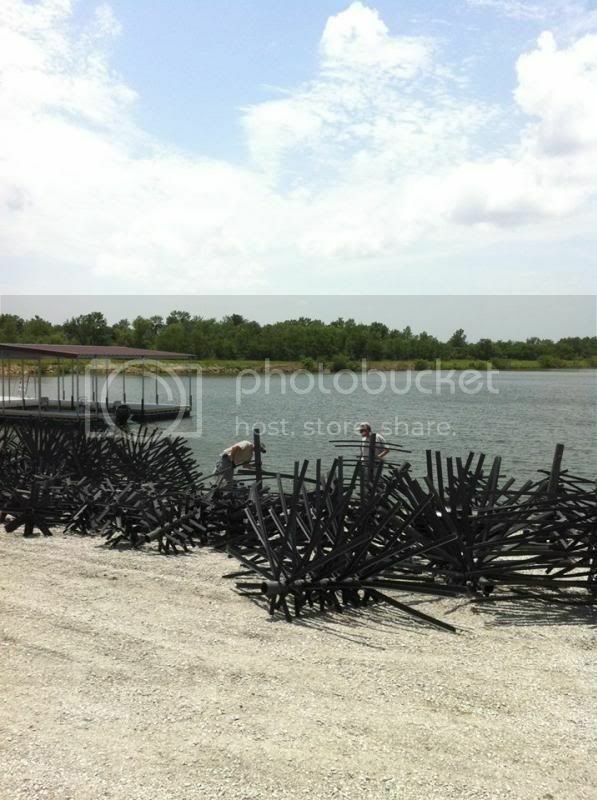 These pics are of 3 brush piles that were placed in a CNBG preferred spawning flat. It was hard to get a pick of all three, but they're in 6" to 3' of water, and abut 15' apart. 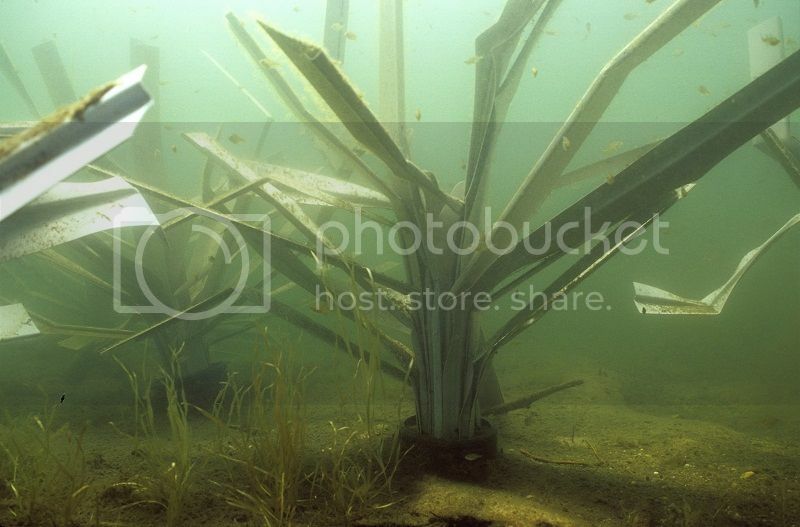 They were placed adjacent to hybrid lilies, reeds, and water primrose. Aside from trimming trees I wanted to keep, having brush cleared and tank dug, these are my first two tank projects. The 75 year old original tank dam had huge mesquite trees and many had to go in order for the dozer to do its job. 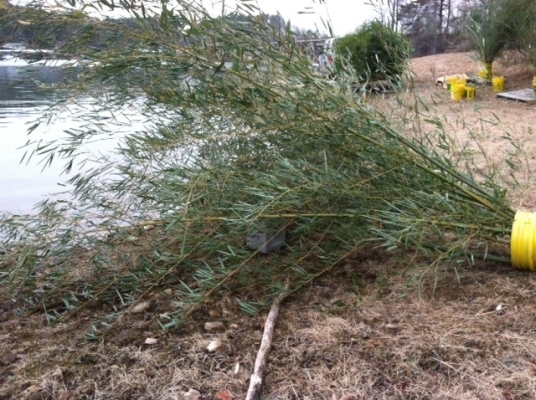 The dam was nearly tripled in thickness so the remaining trees are not a concern. I don't need that much firewood and don't have a splitter. Rather than push them into a burn pile I saved the large logs. Sure could've used some help that day! Once the tank was complete I made a fish crib and packed it with cedar. Each corner of the crib has a T-post and all logs were tied with fence wire. The cedar "furniture" is held in with 8 cinder blocks via fence wire crossing over the top of the crib. The blocks hang outside of the crib. If the tank gets low enough I will be able to raise the blocks to add more cedar. 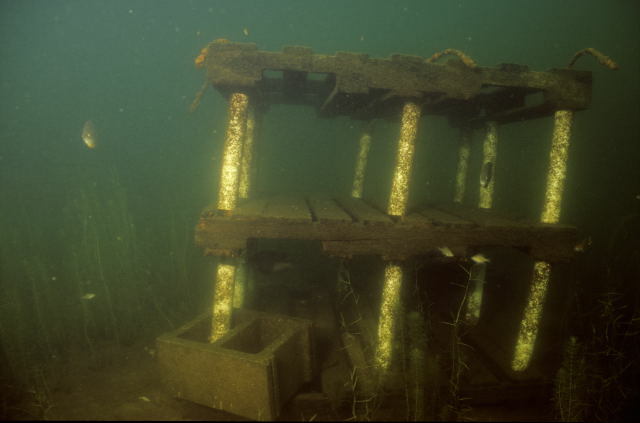 The top of the crib is currently about 5-6ft from the surface. This area is in oil country not far from where it was discovered a 100 years ago. There are active wells on the property and when we bought the land there was unused oil stuff everywhere. Originally I cut up the PVC lines that had carried salt water and intended to burn them...I believe this is a better use. 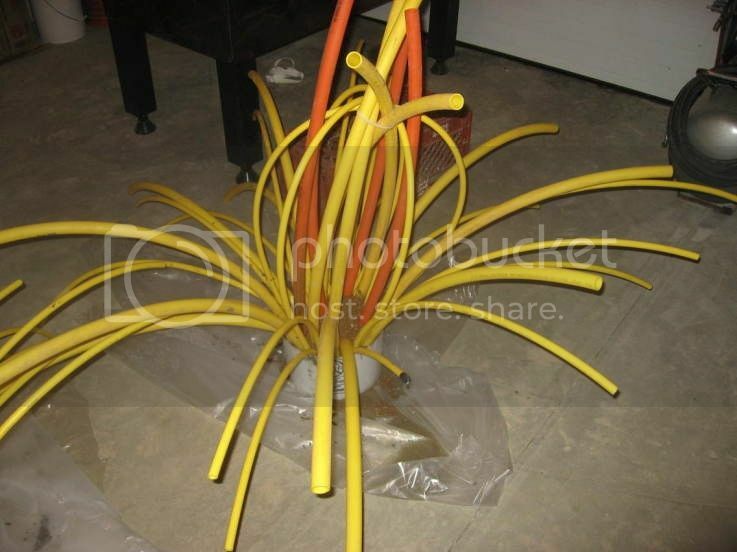 We have several plastic barrels that had been quail feeders. Rats are determined you know?... I first drilled a 1in hole into a plastic barrel, heated the hole with torch and used a softball bat to expand the hole further. While still warm I shoved a short piece of the PVC in the hole until mostly cool. 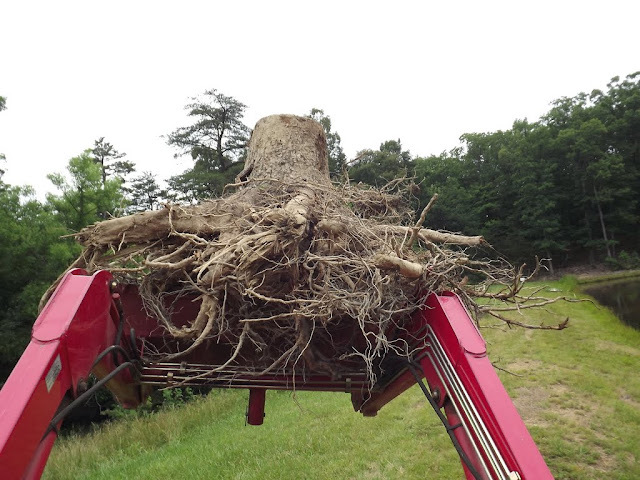 The 6-8ft limbs all float independently so that during a dreadful drought they will stay in the water. Each limb has a single 4in deck screw about a 8in from the end inside the barrel. The screw acts as the hinge and keeps the limb from pulling out of the barrel. Each limb has a little expanding foam in the outer tips to assist with floating. Probably not necessary. I had a 35lb plate that went in the bottom of the barrel before adding the limbs. It still floated so I filled with 4-5 buckets of dirt and gravel. 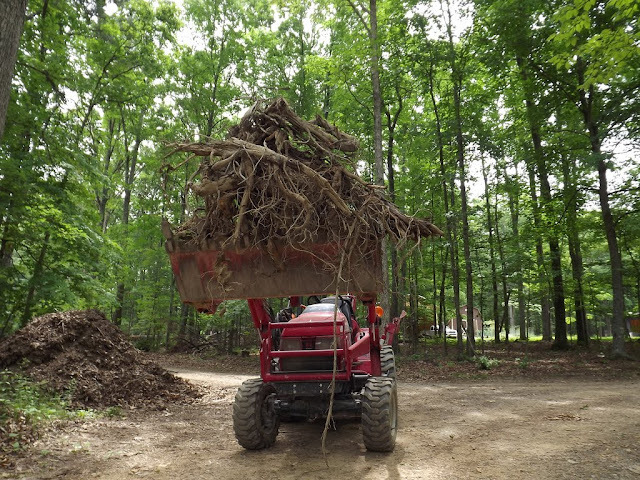 Using dirt and small gravel allows the limbs to move whereas rock would fix them in place. As the tank filled the limbs appeared to work as designed or at least well enough! The buoy is attached to an old window weight inside a vertical 8ft PVC so that it can also rise and fall with the water level. Now that the tank is full, I wish I had done more. Habitat is much more difficult to add! Now I need a blow torch to cut holes in old deer feeders.